The highlight of this Bali adventure cruise is the Discover Scuba Dive, where you'll dive into the blue Bali waters to explore a gorgeous underwater world filled with bright coral and darting fish. You'll be able to dive to a depth of 12 metres/40 feet with an experienced instructor, and will learn the basic skills of scuba diving. Apart from the thrilling DSD Dive in Bali, you'll also be able to go snorkelling, go on unlimited banana boat rides, jump on the 115-foot slide that goes right into the ocean, or descend into the semi-submersible coral viewer that lets you see the underwater world without getting wet. CHARGES FOR KIDS: Kids of all ages are allowed on this cruise, but only children over 10 years will be allowed to go scuba diving. Please check the Additional Instructions sections below for different costs for kids, and get in touch with us to book for children in your group. NOTE: Adults who want to join this cruise but do not plan to do any diving are very welcome. Please check the Additional Instructions sections below for costs for adults who won't be diving. Starting from Benoa harbor, your luxury cruise catamaran will take you to the beautiful Nusa Lembongan island, in southeast Bali. Nusa Lembongan is known for its gorgeous white sandy beaches, rocky cliffs and blowholes, but most of all, for the rich marine life under the blue waters. You'll be taken out to a pontoon just off the coast of Lembongan, and this is where you'll spend the day. From here, you'll do your Discover Dive, go snorkelling, swoosh down the giant water slide, and go into the semi-submersible coral viewer. You'll return to the catamaran for a delicious buffet spread for lunch, and carry on with your day's activities. The boat departs from the pontoon around 15:15 hrs, and you'll be back at your hotel by evening. • Sign up for an exciting day of adventure in a tropical paradise. • Do your first Discover Scuba Dive in the pristine waters of Nusa Lembongan. 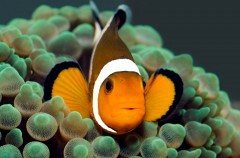 • Go scuba diving or snorkelling to explore gorgeous coral reefs and colourful fish. • Jump onto a giant slide and swoosh down 115 feet into the ocean! 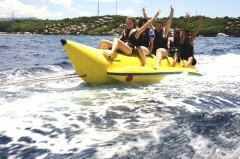 • Go on unlimited banana boat rides. • Visit the semi-submersible coral viewer to see the underwater world without getting wet. • Dig into a delicious international buffet lunch aboard the cruise. Littering in and around the water bodies or on the boat/cruise is not allowed. Locker facilities are included in this package. You will be responsible for your own belongings during this scuba trip in Bali. The operator will not be responsible for any loss or damage during the Bali scuba cruise. 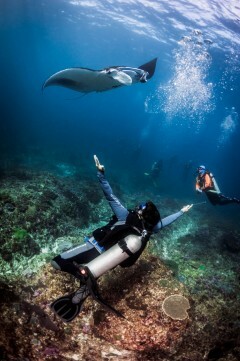 The operator will provide the equipment during the Bali scuba cruise. You are responsible for the equipment and must use it with care. Participants are strictly prohibited from carrying weapons, guns, illegal drugs and psychotropic substances, alcoholic beverages and/or other hazardous substances, explosives and specific fruits such as durian on the Bali scuba cruise. You will not be allowed to participate in the Bali scuba diving activity if the instructor believes you to be ill or under the influence of drugs or alcohol. MEDICAL NOTE: All divers must complete a medical checklist before diving in Bali. 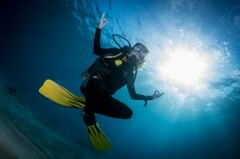 Guests who have in particular asthma, heart complaints, diabetes and/or are pregnant cannot dive unless given clearance from suitable physician. If cancellation is made 2 days or more before the departure of the Bali scuba cruise: Full refund, minus any transaction charges. If cancellation is made between 0-1 days before the departure of the Bali scuba cruise: No refund. The operator takes utmost care of the participants and has the right to cancel, change or reschedule the itinerary of the scuba diving trip in Bali if it appears harmful to the participants or staff. The operator reserves the right to search a passenger or his/her belongings for security purposes. The operator is not responsible for any injury, accident or death during the Bali scuba cruise or sea transfers. The operator reserves the right to stop or dismiss any participant, or cancel the sea transfer without any refund or compensation for safety and security reasons. In case of bad weather, the operator will reschedule the trip and is not liable to pay a refund or compensation to any participant. Children between the age of 10-14 years will be charged INR 8150, and may participate in the diving activity. Children below 10 cannot do the Discover Scuba Dive and will be charged INR 4800. For adults who want to join the cruise but will not do scuba diving, the costs are INR 6690 per person. Pick-up schedule for the fun diving in Bali: Nusa Dua (06:45-07:00 hrs), Tanjung Benoa (07:00-07:15 hrs), Jimbaran/Kuta/Seminyak (7:15-7:30 hrs), Sanur (07:30-07:45 hrs). The pick-up schedule starts at 06:45 hrs, depending on your location. You'll be driven to Benoa Harbour, where you'll board the boat. You'll be served tea/coffee and snacks as you sail towards Nusa Lembongan. The boat docks beside a pontoon off the coast of Lembongan for the rest of the day, where you have a host of activities to choose from. You'll do your Discover Scuba dive, go snorkelling, slide down the 115-foot slide, visit the semi-submersible coral viewer, go on unlimited banana boat rides, and enjoy a day of tropical fun. Once you've built up an appetite, you'll eat a big lunch, enjoying many options at the buffet spread. The catamaran departs from Nusa Lembongan Island by 15:15 hrs. Relax and enjoy the stunning views of Bali. You should reach the harbour by 16:00 hrs and you'll be dropped off to your hotel by 17:00 hrs. Your trip ends here. Your trip ends before sunset. You'll be picked up from your hotel for this Bali diving trip. Please check the pick-up schedule for hotel transfers from the Additional Policies section. 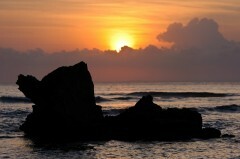 The operator will arrange your transport to the start point of the Bali adventure cruise.